In 2010, the vision of a gathering place for Downtown Fort Worth became a reality. It all started on a site set aside 25 years earlier by property owners. 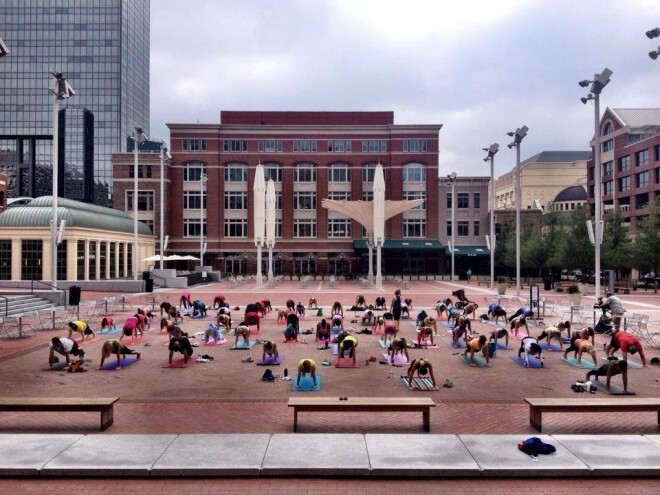 Sundance Square, a 35-block area in the heart of downtown, was the site of a series of interventions intended to jump-start activity on the future plaza. Inaugurating this new era for the city, Sundance Square management hosted a flurry of events in two parking lots in the center of the site: summer movie nights; weekend farmer’s markets; a Holiday Tree lighting ceremony; professional boxing matches; the annual Main Street Arts Festival; and events for Super Bowl XLV. 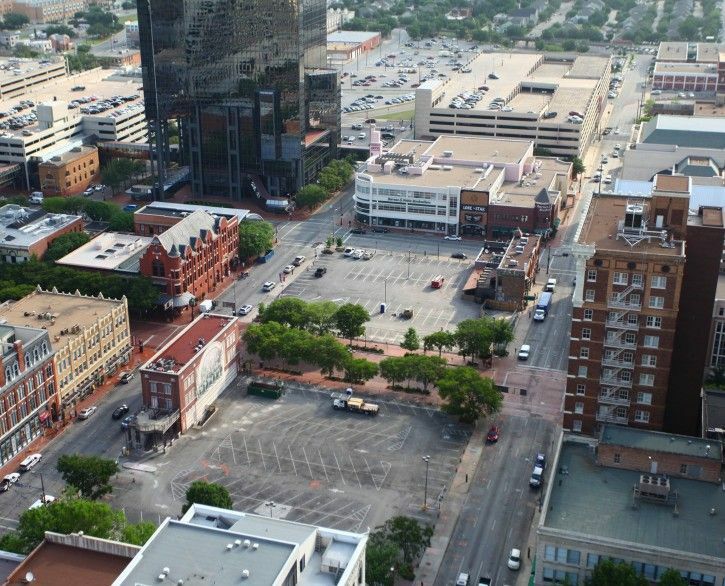 This process not only encouraged a broad constituency of people to come downtown on a regular basis, but also served as a way of furthering the long-range goal for downtown Fort Worth to function as a “place” even without a special event underway. 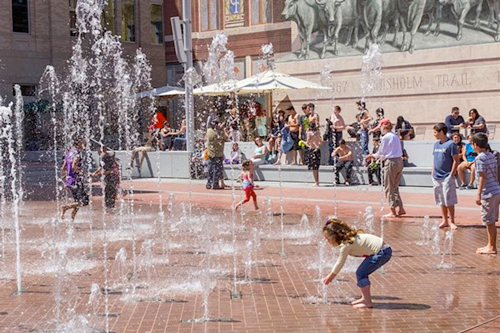 By 2012, the desire to create a permanent plaza was gaining momentum. First, local stakeholders assessed and set goals for Sundance Square. The area would attract people at different times of day, week, and year by providing a variety of comfortable places to sit, along with interactive attractions for kids. They wanted to see a broad range of events taking place, as well as the appearance of a new, strong identity for the District, as Fort Worth’s town square. The streets and sidewalks surrounding the plaza would become more conducive to walking with sidewalks wide enough to encourage sidewalk dining, alongside other commercial activities. In other words, the Plaza would be well-connected to adjacent streets so that when people approach it from any direction, there are clear indications that a special “place” lies ahead. Since opening in 2013, Sundance Square Plaza has been widely hailed as a 55,000-square-foot “living room” for the city. People come alone, with families, or with out-of-town friends to marvel at the interactive fountains, catch the light shows dancing off the 32-foot umbrellas standing in the plaza, dine at restaurants around its perimeter, or enjoy programming offerings that range from yoga to outdoor movies, music, and guest speakers. 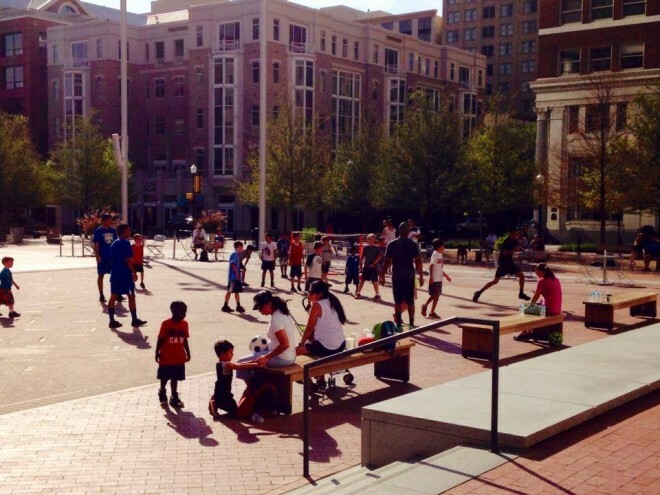 The Plaza has also been a catalyst for the entire downtown, stimulating economic revitalization. Ed Bass, the developer of Sundance Square, called the plaza a “true centerpiece in downtown Fort Worth that will become a destination for generations to come.” More than 275,000 square feet of mixed-use development has sprung up around the plaza since its inception. In addition, several streets have been narrowed to reduce traffic speed and noise, making make it easier for pedestrians to cross into the Plaza at intersections. With a Plaza at its heart, the Sundance Square district can make a credible claim to be the arts and cultural capital of Texas. Before - a lifeless parking lot.